Have students try these activities to expand their knowledge and interest in Greece’s Golden Age. 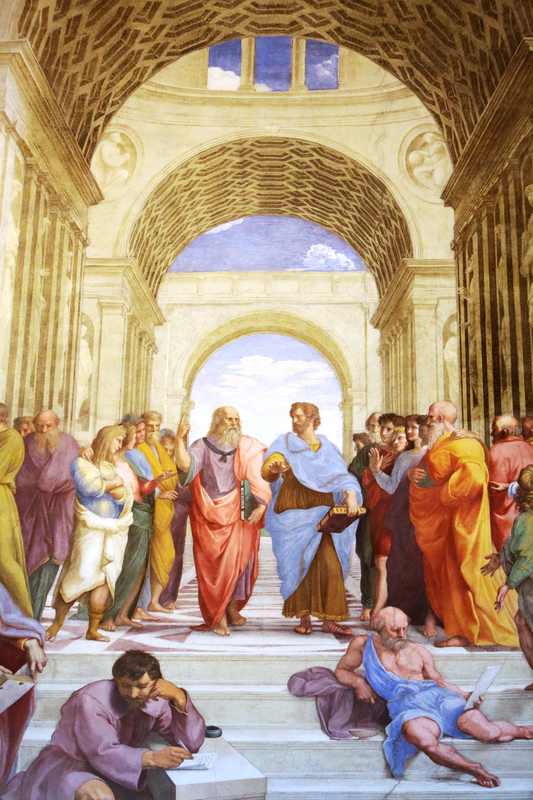 Socrates, Plato, and Aristotle revolutionized the Western philosophical tradition. A big part of practicing philosophy is participating in discussions with groups of thinkers who are all interested in the same topic. Lead the class in a philosophical discussion. Begin by choosing a question to focus on. Here are some possibilities: Is it good to do homework because your teacher says you should do it, or does your teacher say you should do it because it is good? Why is it good to get good grades in school? Why is it good to have fun? that the question is interesting and open-ended and will get students to start thinking critically. When students attempt to offer answers to your question, use the Socratic method to move the discussion forward. For example, if a student argues that homework ought to be done because his or her teacher says so, then ask why students ought to do what their teachers say. Invite the whole class to participate in the discussion and in the Socratic questioning. During Greece’s Golden Age, artists and writers created numerous works in styles that the world had never seen before. Sculptors and painters wanted to depict human beings as realistically as possible. Storytellers and playwrights created humorous and tragic tales that gave insight into the depths of human nature. Invite students to create a work in the medium of their choice— sculpture, painting, illustration, story, poem, or play—and encourage them to make their work engage with the question of human nature just as the Greeks did. Suggest that students all present or share their work with the class. The Parthenon is a shining example of the enormous influence classical Greek architecture exerted on future generations. Have students research classical Greek architecture by using the Internet or other available resources. Be sure to have students focus on the specific kinds of features that classical Greek buildings tended to have. Then have students build their own model Greek buildings using wooden craft sticks and glue. Encourage students to make their models as historically accurate as possible. The Peloponnesian War raged between Athens and Sparta for many years. We have detailed historical accounts of these years, too, thanks to Thucydides. Have students research the Peloponnesian War using the Internet or other resources. Then have students prepare short written reports on an important event or person from the Peloponnesian War. Students can select an event or person to write about from Greece’s Golden Age, or from their own research. Finally, have students share their reports with the class. Alexander the Great is undoubtedly one of the most important single figures in Western history. His father, Philip, worked hard to unify the Greeks, and after Philip died Alexander continued his work. Alexander expanded the empire his father had begun to include parts of Eastern Europe, Northern Africa, and Western Asia. Invite students to research and study the life of Alexander, using the Internet or other available resources. Have each student prepare a written report or slideshow about Alexander’s life. Encourage them to focus on Alexander’s development as a young person and on his exploits as a military leader. Aristotle was a philosopher who lived and taught during Greece’s Golden Age. He was particularly concerned with understanding the natural world, and his works included some of the first attempts at practicing modern scientific disciplines such as physics and biology. Students will likely not be able to engage directly with Aristotle’s works; however, they can learn about some of his ideas through secondary sources (whether Internet or print). Ask students to choose one aspect of Aristotle’s thinking and to report on it, either orally or with a slideshow. Students might discuss Aristotle’s thinking about animals or about physics. They might discuss Aristotle’s thinking about logic or language, as well. Students need not capture every detail of Aristotle’s thinking. It is more important for them to understand the kinds of questions that were important to Aristotle, and why.